Quite bushy plant, I went heavy with defoliation.. Also it's easy to overfeed, I went really low on the fertilizer during flowering, and flushed for 2 weeks. This is my 7th grow of high CBD strains, and 2nd time growing this strain, I recommend it! 9/10!! It took 12 weeks from switch 12/12 hours until harvest. Very resinous with pungent smells. It have been drying for 8 days. The weather is good.. It weighs 107g, stems removed..
the herb is very sticky, it smell is ok, good. The high is nice, energetic and relaxing. Just a little strong to me, I prefer something lighter, but still recommendable. 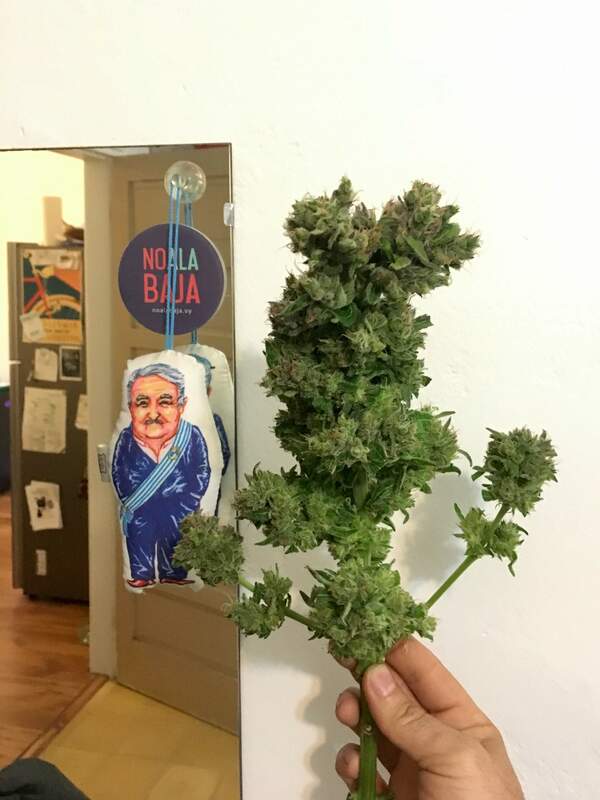 El porro del Pepe! Arriba Uruguay! It's legs were stuck on the buds resin. That's all folks! Thanks for passing by! There's no many option of fertilizer for coco coir in my region, and AN are expensive here. But it's good! I prefer to feed light in coco, it's easy to overfeed. The "ph perfect" is really nice! Expensive, but good! I like it. The plant is nice to grow, and produces good herb! Recommend it. @Tryhard, to the lungs too! :) Thanks. Really good grow! How would you describe high of this strain? The high is nice, energetic and relaxing. 50% body, 50% head I'd say. But just a little strong to me, I prefer something lighter, but still recommendable. @Tesla, Thank you for getting it tested. I prefer high CBD with 5% or lower THC. I would have gotten these seeds and been in for a ride. Now I know to look for something lower THC.